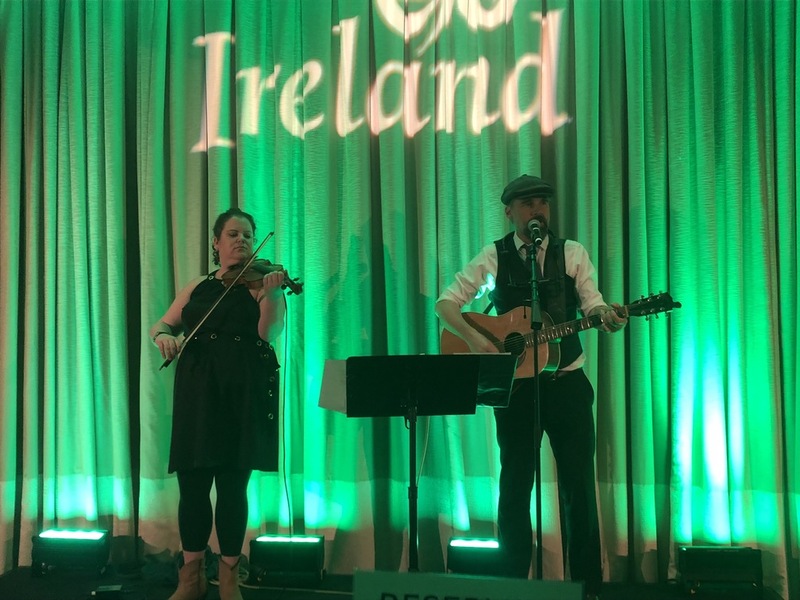 After sitting-out last year’s Jump Into Ireland fete, I was happy to return to it. I love that they often switch-up the venue, and this year held two surprises for us. 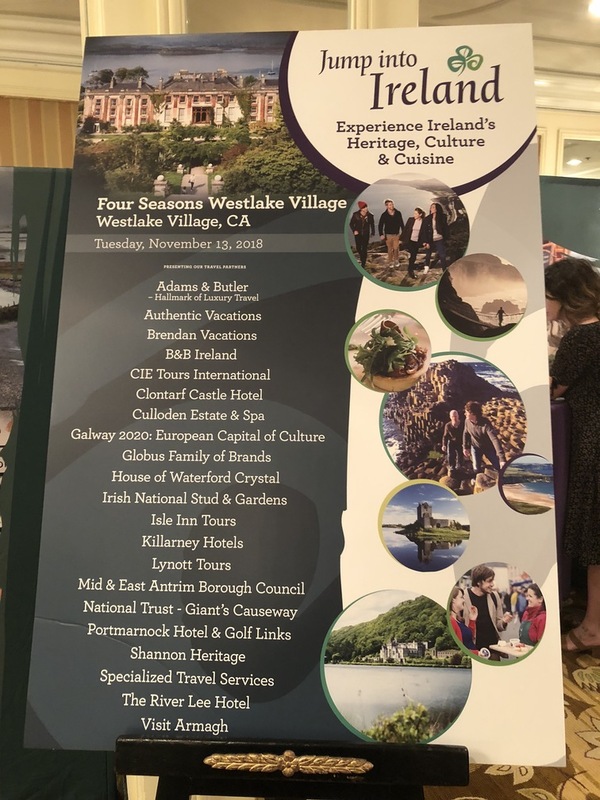 It was due to be held at the Four Seasons in Westlake Village, which is beautiful, but very hard for most local Angelenos to get to on a week night. And since I was also invited to several other events that same night, in locations much closer to me, I was a bit iffy on attending. 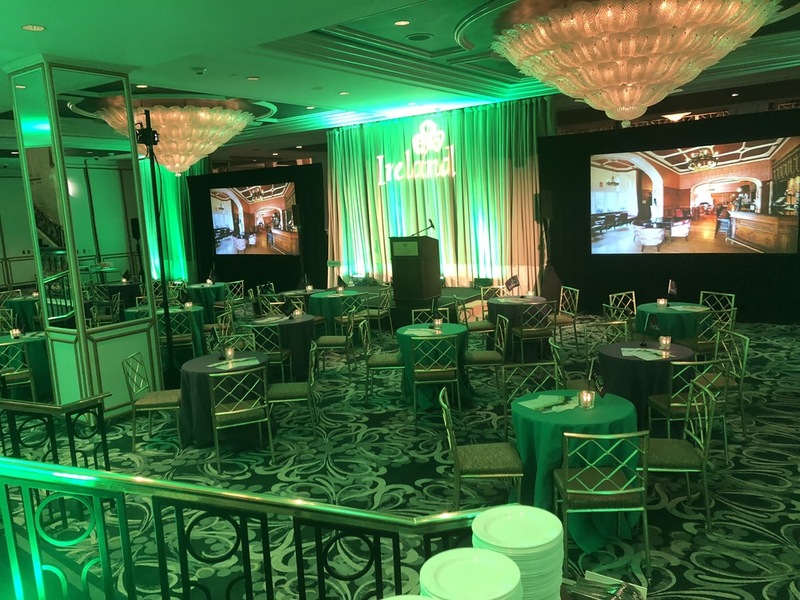 But, because of the horrendous fires in that area, the soiree had to be moved to the Beverly Wilshire Hotel, which was not only much more convenient for yours truly, but I’m sure for most attendees. And I have to laud that hotel for doing such a commendable job on that short notice. They really made it beautiful. Carrie Malloy dancing. Photo by Karen Salkin. 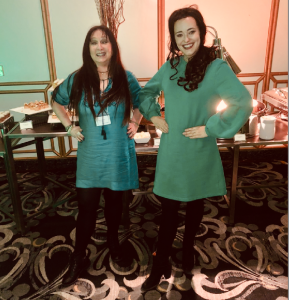 Karen Salkin and Carrie Malloy, in their matching Irish Dance ensembles. Photo by Imaan Jalali. 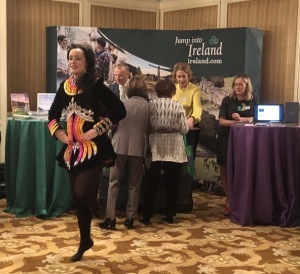 We mingled and met with the representatives of cities and hotels in Ireland. I keep waiting for this Tourism Ireland group to have a press junket so that I can finally visit them all! Especially the places that serve afternoon tea! Some of the reps plied me with images of theirs to whet my appetite, both literally and figuratively! 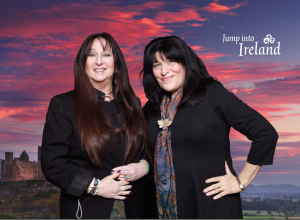 Karen Salkin and Roz Wolf. You can see part of Ireland on the bottom of Karen’s outfit, where her jacket opens, because she was wearing a green dress! The musical duo. Photo by Karen Salkin. Then we moved downstairs to a different room, all bathed in green light. [Note: See the pic at the top of this page.] I right away knew what Dorothy felt like in the Emerald City! It was all so beautiful! 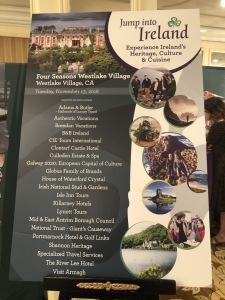 This is where they did the little Jump Into Ireland presentations, to demonstrate a bit of what the different areas are like. When that was over, we moved on to the elegant, generous, sumptuous dinner buffet. The first part was the best salad bar I’ve ever come upon. 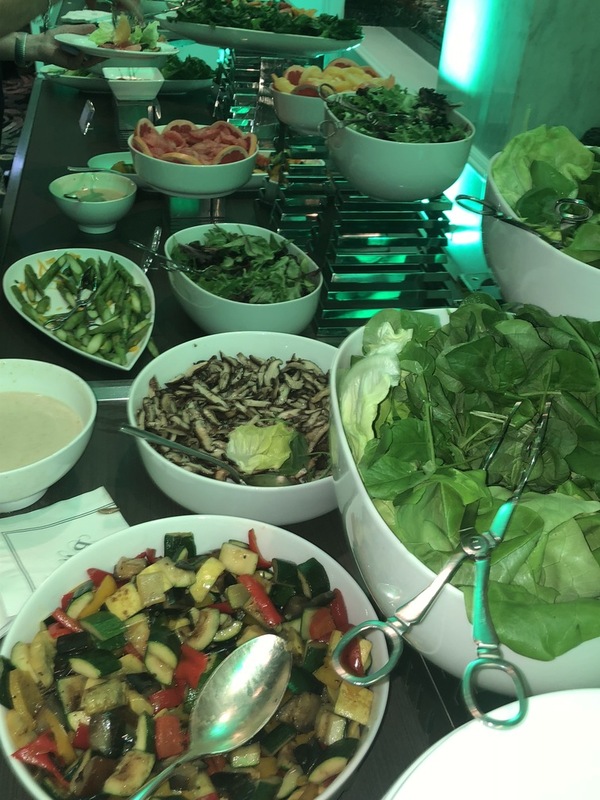 There were three different types of deconstructed salads, which means they provided all the ingredients separately, so we could choose just the ones we like. They must have known that picky moi would be there! Part of the salad selections. Photo by Karen Salkin. 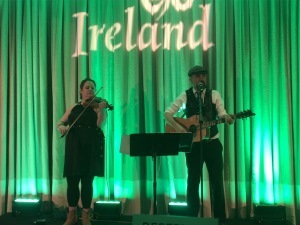 All the while, we were serenaded by that strings duo again. My friend and I had such a good time that we were among the last to leave! So, hopefully, I’ll make it to their rich green country before this time next year. And you’ll find me in one of their hotels feasting on afternoon tea!